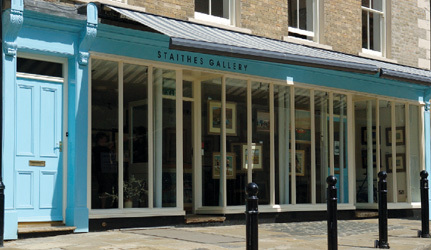 Staithes Gallery is housed in an elegant Georgian building on Staithes High Street. The village of Staithes on the north Yorkshire coast has always been and still is a magnet for art and artists.Our aim at Staithes Gallery is to provide a showcase right in the heart of the old village for the very best contemporary artwork inspired by Staithes and the surrounding area. Our exhibitions reflect the quality and variety of art stimulated by this most inspirational of villages. Visitors and residents alike are most welcome to come and browse our current exhibitions. We are open Wednesdays, Thursdays, Saturdays & Sundays: 10am – 5pm. The inspiring village of Staithes is a wonderful place to visit. The Smugglers is a spacious and elegant five bedroomed maisonette with a large and versatile sitting/dining/function room overlooking the High Street. The Laura Knight Studio is a cosy studio/cottage hideaway where the Staithes Group Artists Laura and Harold Knight once painted. The village of Staithes offers innumerable opportunities for all kinds of artists, from the professional to the complete beginner. Staithes Art School offers painting breaks with experienced tutors for anyone wishing to learn, improve or just have a go.